BETTER LIVING THROUGH CHEMISTRY is a cool dark comedy feature from first time writer-directors Geoff Moore and David Posamentier. It stars Sam Rockwell as a bored suburban pharmacist married to a hyper competitive wife (Michelle Monaghan). He falls for a glamourous rich bored housewife (a wonderfully slick Olivia Wilde) and their joint use of drugs gives him the confidence to get petty revenge on the people who've held him down until the drug use spirals out of control and the DEA get on his back. The whole thing gets unravelled in an elegant manner and despite the overall tone of wry dark humour, perfectly captured in Jane Fonda's voice-over and the ironic sound-track, there's actual deep emotion in there. The final scene between Rockwell and Wilde subverts the fantasy elements of the film in a genuinely affecting way. I really want to see what these directors do next. I also really want to see more of Sam Rockwell. Why isn't he a bigger star? When he can do proper gonzo goofball comedy and proper depth? 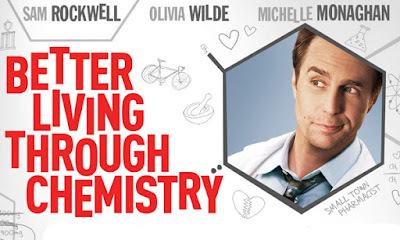 BETTER LIVING THROUGH CHEMISTRY has a running time of 91 minutes. It was released earlier this year in the USA and is currently available on DVD.